Tank Details: 18x12x15 Clearseal Tank . 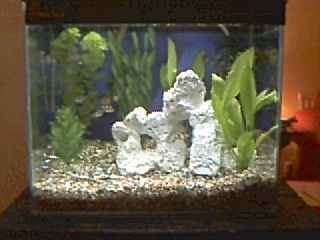 The Fish: 7 Tiger Barbs, 5 Cardinal Tetras, 2 Otocinclus for the algae and a red crab who is very entertaining when climbing plants and the decor. Also likes to sit on the glass shelf in the top of the aquarium. Very underated inhabitant I feel ! Comments: Undergravel filter and carbon filter on the outlet pipe. Mixture of real and plastic plants.